It’s day 19 of Blogmas and I’ve been wanting to write this post since October so I’m excited I’ve finally been able to do it! I bought 4 products from Lush’s Christmas range and tried them out so today, I’ll be telling you what I thought of them. This was the first of the products that I tried and I absolutely hated it. 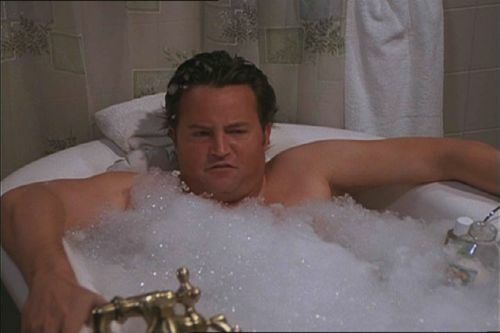 When I put it in the bath, I felt like Chandler when he tries to make his own bath in Friends. It was horrible. There were bits floating and sticking to me I really didn’t enjoy it at all. My skin felt disgusting when I got out of the bath, it was probably the cocoa butter, I really don’t like that stuff! It was stuck on me and the bath and it was quite difficult to clean. The Christmas Sweater bath bomb was the next product I tried and it was my favourite by far! The smell was amazing, the patterns in the water were so pretty, I loved it so much! I love it when an unexpected colour comes out of a bath bomb like this one did! I think it’s my favourite bath bomb that I’ve ever tried. So, honestly, I don’t feel I gave this a fair shot because it’s so pretty, I wanted to save it as long as possible. I read online that the best way to use this product is to break off a bit and crumble it under running water – which is what I tried to do. It was so hard to crumble but it did make some bubbles. The next time I use this product, I’ll definitely swish the stick around in the water which is what the instructions from Lush say. I really loved how it smelled, it was sort of bubblegum-y. I was a little disappointed with this jelly bomb. I’ve tried one before (read about it here) and this one wasn’t very jelly in comparison to the other one I tried which was both good and bad because it’s a nightmare to clean but it’s still a jelly bomb so I expect some jelly. The fizz on this jelly bomb wasn’t great and it seemed to stop dissolving after a while and just float around then when I gave it a push, it started again. It was quite strange. I really enjoyed trying out these products (except the bear one!) and I’ll definitely buy more products from Lush again, just maybe ones that don’t contain cocoa butter. Have you tried any of these products? Let me know what you thought of them in the comments! If you missed yesterday’s post, you can read that here.